A callous fraudster who befriended a vulnerable pensioner and left her penniless after fleecing her out of more than more than £150,000 has been jailed. Heartless Lynn Minrath pumped thousands of pounds into betting shop slot machines as she took more and more control over her victim’s finances, a jury has heard. 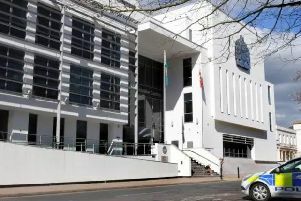 Minrath, 42, of Kelsey’s Close, Wolston, was jailed for four years after the jury at Warwick Crown Court found her guilty of five charges of fraud, two of forgery and one of theft. Minrath, who had denied all the charges, claiming she had acted with the consent and wishes of the pensioner, was acquitted of two further fraud charges and another alleged theft. Mr Bright said that in 2014 the pensioner had in excess of £250,000 - mainly from the proceeds of the sale of her own home prior to her moving to share a house with her brother in Rugby. “But that entire sum was soon dissipated within the same year. That she spent a good deal of her own money is a fact, but well over £150,000 was taken by the defendant, taken without her knowledge or authority. “She did it by worming her way into her life, pretending to be a good friend, and worming her way into her victim’s home. Mr Bright said that soon after the pensioner had sold her former home in London and moved in with her brother at an address in York Street, Rugby, Minrath, who was aware she had money from the sale, and her partner also moved in. That included Minrath putting the pensioner’s purse in odd and improbable places, where she would then ‘find’ it and convince her victim that she must have put it there herself. She also convinced the elderly woman that she had been sleepwalking and had been moving and damaging things in her sleep, and persuaded her to drink alcohol and to take more medication than her doctor had advised. After the victim’s bank cards had ‘gone missing,’ no replacements were issued – but they continued to be used by Minrath to withdraw money from her accounts. Mr Bright pointed out that Minrath had ‘very little lawful income,’ yet during 2014 had been able to spend freely and to gamble a staggering £72,000 at Coral’s bookmakers in Bridget Street, and a further £19,000 at a bookies in Chapel Street. She was also able to pay for two holidays and for the rings for a humanist ‘wedding’ ceremony, added Mr Bright. Giving evidence, Minrath denied she would be penniless without money from her victim, claiming she made money from making and selling cakes, charging up to £300 for a wedding cake – for which she said she had not submitted tax returns. The court heard that in 2013 Minrath, whose victim has been reimbursed by around £130,000 by her bank, had been jailed for thefts and frauds from people while working as a child minder. Jailing Minrath, Recorder Charles Foster told her: “This is a course of criminal conduct which extended over a year from January 2014 to January 2015, and the total amount of money involved is £152,401. “You had come to know she had come into money, and you targeted her as somebody who was vulnerable who you could get to manipulate. “You started to work on her to convince her she was more vulnerable than she in fact was by cynical devices such as hiding her purse in improbable places and that she was sleepwalking down the road. “That was part of a systematic and cynical campaign to put her at your command, and it worked. She gave over to you the use of her bank cards and pin numbers and the password for internet banking. “You used the cards to take out large sums of money. A large amount of money was gambled away. You and she would go down to Corals and put many thousands of pounds into slot machines, but you were the much heavier gambler. “When it became clear you were about to be discovered, you took off, hoping to avoid detection, taking with you a bag of documents containing financial information. “There are a number of aggravating features. You abused the trust she placed in you, there was significant planning, the activity was conducted over a considerable period, and you had deliberately targeted her because of her vulnerability.